The sight of her curves makes my mouth water. The fire deep inside me threatens to rage out of control. But every time I try to claim what’s mine, she slips away. As one of the wealthiest casino owners in Vegas, there’s no doubt I could have any woman wrapped around my finger in a heartbeat. Until I met Ava Winter. There’s something haunting behind those enchanting eyes that I just can’t read–and this mysterious beauty won’t let me. As much as she pushes me away, I can’t resist her. But I know I shouldn’t allow myself to give in to the fiery temptation. Not if I want to keep her safe from the other dragons in Sin City. 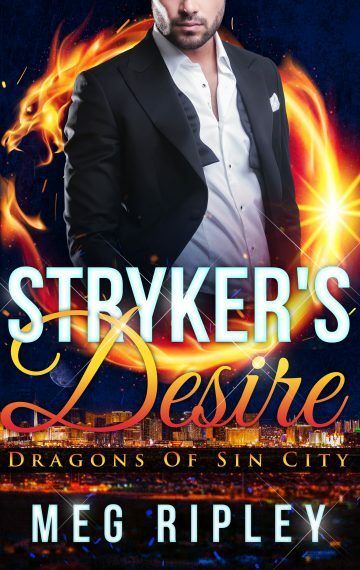 Stryker’s Desire is a standalone 32,000 word novella with steamy shifter scenes and explicit language written for readers age 18 and over.